So many species, so little time. . . .
Our daughter Jessica has over 18 years of experience and now lives in Dripping Springs, Texas. Welcome to our newly designed website! We are so excited to share our love of orchids and rare tropical plants with you. Our first orchid was a gift more than 23 years ago and led us to follow our passion and become a grower, first in Texas, then Florida and now we are back in Texas to stay! Please browse our site for weekly specials, upcoming events, plants available for sale and tips for orchid care! Please don't hesitate to contact us with any questions at all. 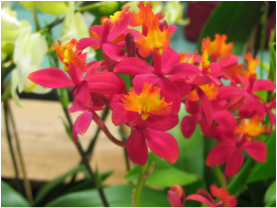 We enjoy talking personally with customers to insure satisfaction and success with growing our orchids and tropical plants!